Found 3 file extension associations related to True Basic Bronze Edition and 3 file formats developed specifically for use with True Basic Bronze Edition. True Basic Bronze Edition is Integrated development environment that allows programmers to create applications in BASIC programming language. The Bronze Edition give you three working windows. Write your source code in the editor window, choose RUN, and you will quickly see the results of the source code you wrote in the integrated output window. A command window at the bottom of the screen is useful for those who prefer to do command line editing. With the Bronze Edition you can run and write programs of any size. There are no line limits and every statement and function of the True BASIC Language is supported. You can write and store libraries that can be called from any program you create. The Bronze Edition enables you to ompile any program to fast and compact b-code for faster loading and execution. It also includes Help files and a DO menu for automating routine tasks. 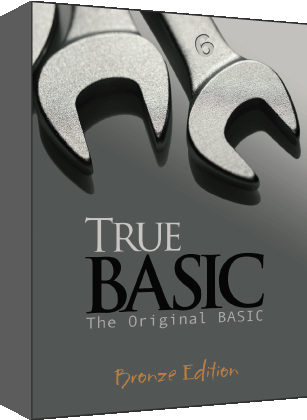 If you need more information please contact the developers of True Basic Bronze Edition (True BASIC), or check out their product website.